The Herschel Advantage IRP4 is an ideal heater for industrial interior spaces, with its robust design and 2600w power output. The IRP4 is perfect for garages, workshops, factories and other hard-to-heat spaces. Download the Herschel Advantage IRP4 datasheet and installation manual here. This Herschel ceramic heater will need to be ceiling mounted by a professional electrician and is not suitable for use outside. Its IP20 rating indicates that it offers no protection against water and is therefore unsuitable for installation in areas that are exposed to pressured jets of water, sprays, drips or humidity. Ceiling brackets are supplied with purchase but you may need additional fittings to achieve the desired installation height. Please read over the product’s manual carefully to ensure your installation adheres with the manufacturer’s guidelines. The recommended mounting height for this product is between 2.8 – 3.5m from floor level and should never be installed lower than 2.8m. The IRP4 should be installed at least 125mm away from the surface of the ceiling and 1.5m away from any walls. The gentle heat of far infrared is more easily impacted by draughts and breezes of cold air because wind-chill can cool your body quicker than the heater can compensate for this loss. For this reason, we would always recommend installing ceramic heaters in a sheltered location to ensure they operate at maximum efficiency, and not next to warehouse shutter doors or frequently opened windows etc. This product can heat a 21m² area when installed in ideal conditions but this can be reduced by a third if fitted in an exposed location. We strongly recommend fitting any infrared heater with additional controls to help you get the most out of your product. Motion sensors, push button timers, and thermostatic controls for indoor heaters all provide a greater range of heat management and can help to reduce running costs by limiting energy usage as much as possible. Control units do cost a little bit extra but the energy saving potential they provide makes them a more than worthy investment. All Herschel ceramic heaters have a 5 Year Manufacturer’s Warranty. The Herschel Advantage IRP4 is an industrial heating solution aimed at hard-to-heat spaces such as warehouses, showrooms, factories and garages. The simple, easy to mount design provides effective heating for staff members even in the most open-plan or draughty industrial spaces. Herschel’s Advantage range uses engineered ceramic plates designed for efficient heat distribution and can reach comfort temperatures in under 5 minutes. To enhance their performance, they also incorporate aluminised steel reflectors which assist in projecting their effective heat outwards to where it’s most needed. The directed, gentle warmth provided by the IRP4 makes it a versatile solution for a number of large scale indoor applications – from industrial units, to factory floors, to car showrooms. The Herschel Advantage IRP4 has an IP20 protection rating and is designed for use indoors. The glare-free heating elements and expansive heating zone make it ideal for workspaces that need an unobtrusive heat source with no visible light. Its high 2600W power output and 21m² coverage means that the IRP4 is the ideal solution for industrial locations with draughty construction and poor insulation. A protective grill is fitted to the outside of the heater to protect the four ceramic elements housed inside from being touched by accident. This feature coupled with a high ceiling-mounted fitting means that the IRP4 is an exceptionally safe option compared to alternative heating methods. All Herschel ceramic heaters are covered by a generous 5 Year Warranty, reflecting their exceptional quality and robust manufacture. This heater is suitable for a ceiling mounted fitting only and will need to be installed by a professional electrician. However, once installed, it will require barely any maintenance aside from the occasional dust down to keep it clean. The benefit of a ceiling mounted solution is that it will allow an uninhibited spread of radiant heat that isn’t hampered by solid objects or corners in the room. The IRP4 can be used alongside other Herschel heaters to provide effective heating over a large area. Give our sales team a call for a free quote tailored to your individual project requirements. Herschel are a prominent manufacturer in the infrared heating industry and offer some of the most advanced ceramic heaters on the market. Exceptional quality, innovative design and effective heating elevate Herschel products over many other competitors and their diverse range ensures that all areas of your home and business are catered for. Their ceramic heaters boast near 100% efficiency and offer significant energy-saving potential when used alongside additional controls to reduce power consumption. For indoor spaces, we highly recommend pairing your ceramic heater with a thermostatic controller for an increased range of heat management options. Why choose a ceramic infrared heater? Infrared is an unbeatable outdoor heating solution as it travels directly from the heat source until it comes into contact with a person or object. Radiant heat works in exactly the same way as the heat we feel from the sun, keeping us warm on a cool day even if the ambient air temperature isn’t very high. It’s a direct A-to-B heat transfer that doesn’t rely on the movement of air molecules to be effective and is the perfect means of warming draughty or open-plan rooms that are difficult to heat. Shortwave infrared used by glowing quartz heaters is the most effective way of combating cooler outdoor temperatures because of its higher intensity. However, the type of heat shortwave provides isn’t comfortable for long-term use, and what’s more, it only provides a shallow sensation of warmth over the surface of your skin. 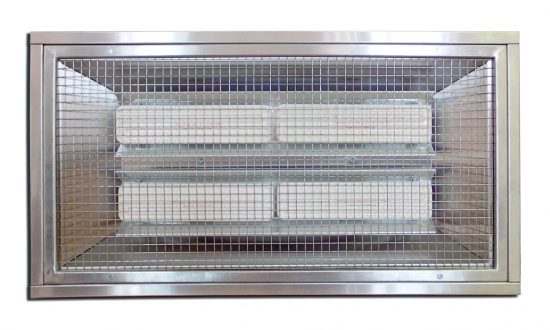 Ceramic heaters use a gentle form of radiant heat known as longwave or far infrared, which is so safe that it’s even used in hospital incubators. Far infrared uses the same wavelength and frequency as the heat emitted by our own bodies, which is why these heaters provide a more lasting and satisfying sensation of warmth that other heaters can’t replicate. Although the infrared they use is a little less intense, the strength of ceramic heaters lies in their ability to be used over long periods of time without any form of discomfort. Ceramic heaters are excellent primary heat sources for industrial areas like workshops and warehouses, or even commercial areas such as cafés, bars and showrooms. Wherever you need a robust heating solution for busy areas which are often in use, ceramic heaters are usually the best choice.